...that I hope will ensure I get some more old projects out of storage and onto beds or walls! It was really motivating just to blog about those I took with me to Florida, and watch the real progress I made getting through eleven of the 26! I was on Quilting is More Fun Than Housework last night, and Cynthia led me to Sew BitterSweet Designs where I found this cool "A Lovely Year of Finishes". Great idea. So, I am going to join in and continue slogging sailing through more of my UFOs. I am embarrassed to contemplate how old this runner is. Sigh. I designed the runner (I just realized that right now!) using three different star blocks. I LOVE stars to this day. Yep, (choke) it was supposed to go on our wooden coffee table in the house we lived in pre-1999. Egad. 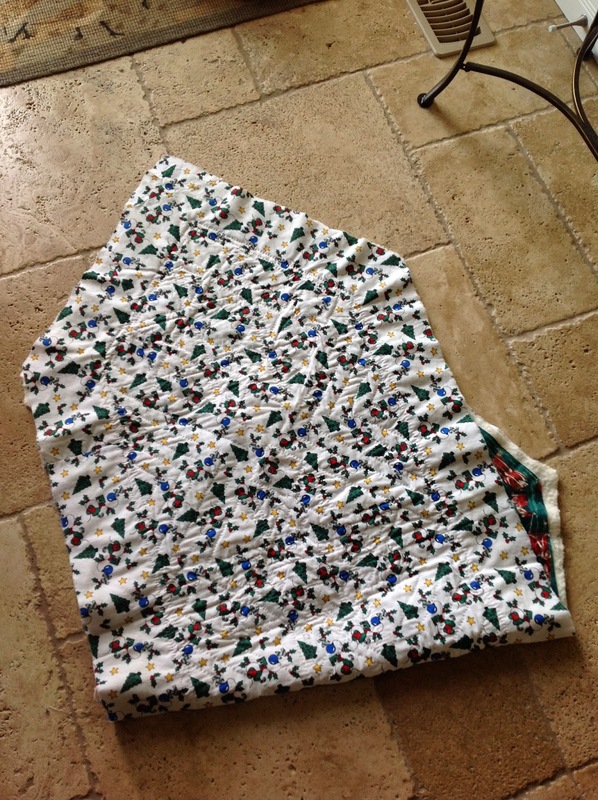 I lost interest in handquilting once I took a free-motion quilting class at my then LQS, Lori's Country Cottage. This is the shop that started me on my quilting journey, way back in 1994. Hey! And they were featured in Better Homes and Gardens' Quilt Sampler in May 2012!! Pretty cool. Also cool is the look of my stitching! It isn't teeny-tiny, but it still looks nice. I did work on it a fair bit this past winter, but did not finish it. The border needs to be quilted, as do some of the background squares in the star blocks, because I think they are too poofy and the quilting lines too far apart. I was thinking of doing a square inside the square I've already quilted and some radiating lines in the triangles, similar to what Joanne is doing in the red triangles on her gorgeous quilt. 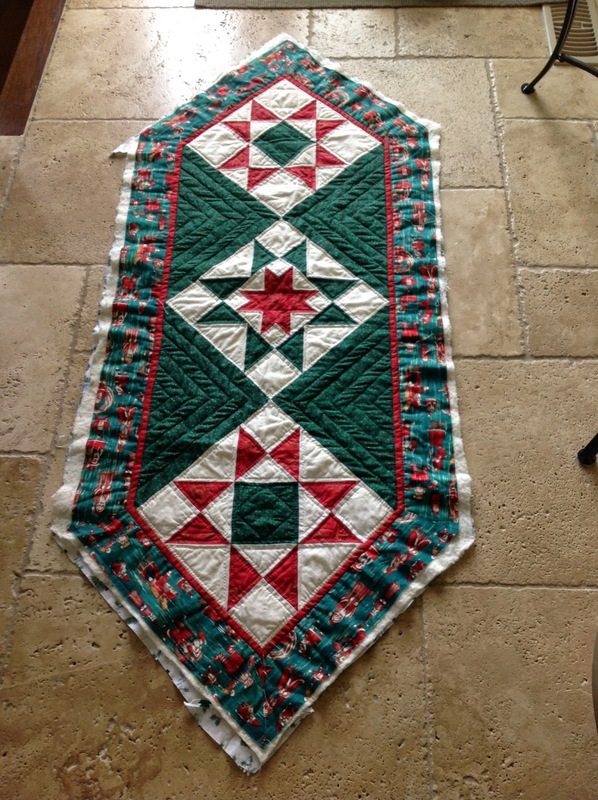 While working on it over the winter in Florida, I rediscovered my love for handquilting, and really, handwork of most kinds. (not so much appliqué, snort) Hope to have this done and bound for the end of May link-up! This is what is left of that green fabric! Killed it! And this will get cut up into two 11" strips for another one of Cynthia's Scrap-a-Palooza quilts. Love it. 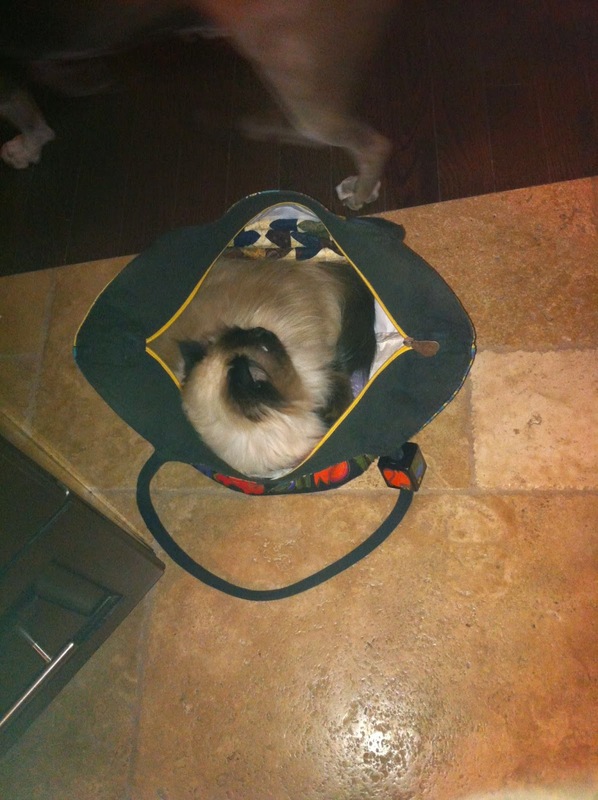 Funny thing is that is my Laurel Burch cat fabric bag! Rocco didn't know what to make of her sitting in there like a princess. WHY do all cats love to curl up in bags? Or on top of a shelf of t-shirts or sweaters in a closet, and then several hours later, when you freak because you haven't seen her in some time, you hear a faint "mew" and the hunt begins... which drawer? cupboard? closet? Ginger loves to curl up in my bags, too! And don't I love Laurel Burch!